From the ridiculous to the sublime, Historics auction at Brooklands Museum on 26th May has something for everyone. 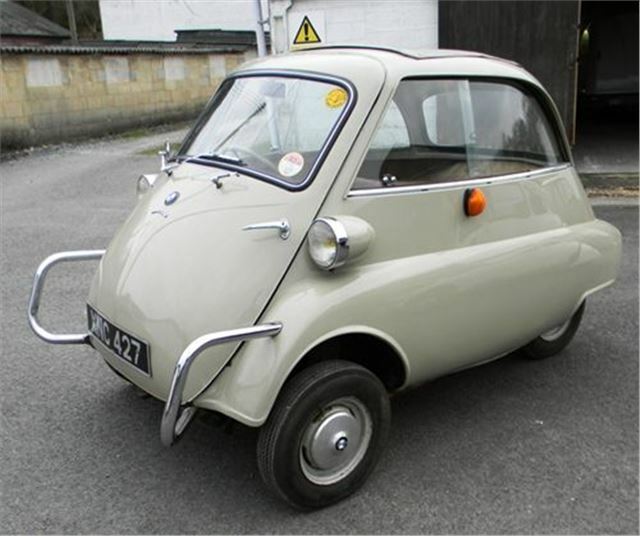 Two bubblecars: a 1957 Heinkel and a 1959 RHD Isetta 300, just like the one with which I began my car dealing career. This pristine example is estimated at £9,000 - £13,000 - rather more than the £60 I got for mine (though I did treble my money on it). 'Barn finds' include an original, completely unrestored 1920 Matchless combination, estimated at £45,000 - £55,000. This 1952 Morris Minor convertible, showing just 32,000 miles and estimated at £2,000 - £2,500. And a 1962 Peugeot 203. Alfa Romeo fans are rewarded with a 105 Series 1970 GT 1300 Junior, a 1964 2600 Spider, a 105 Series 1967 Alfa Guilia Sprint GT Veloce recreated as a GTA and estimated at £32,000 - £37,000 and this beautiful little 1960 Giulietta 1300 Spider estinated at £35,000 - £42,000. Moving on to even classier cars, this 1933 4.25 litre Vanden Plas Bentley tourer is estimated at £100,000 to £140,000. While this 1970 Lamborghini Espada S2 is estimated at £35,000 to £42,000.